Rick Kriseman trailed by as much as 15 points. Kriseman was outspent by nearly $500,000. EPIC FIELD: A fully integrated campaign across all mediums with persuasion and GOTV. (link (Backwards Baker. Campaign Manager Jacob Smith and Field Director Adriene Bogan oversaw a volunteer driven field program that identified over 10,000 supporters and knocked on over 20,000 doors in the final 4 days alone, a nearly 1-1 ratio of door knocks to Election Day voters. MEDIA & DIGITAL’S ROLE IN GOTV, FIELD AND PERSUASION: We had tracks of creative and paid messaging on social media, digital, radio and TV with an eye toward persuasion (increased numbers with independents), GOTV (white Democrats) and African-Americans. 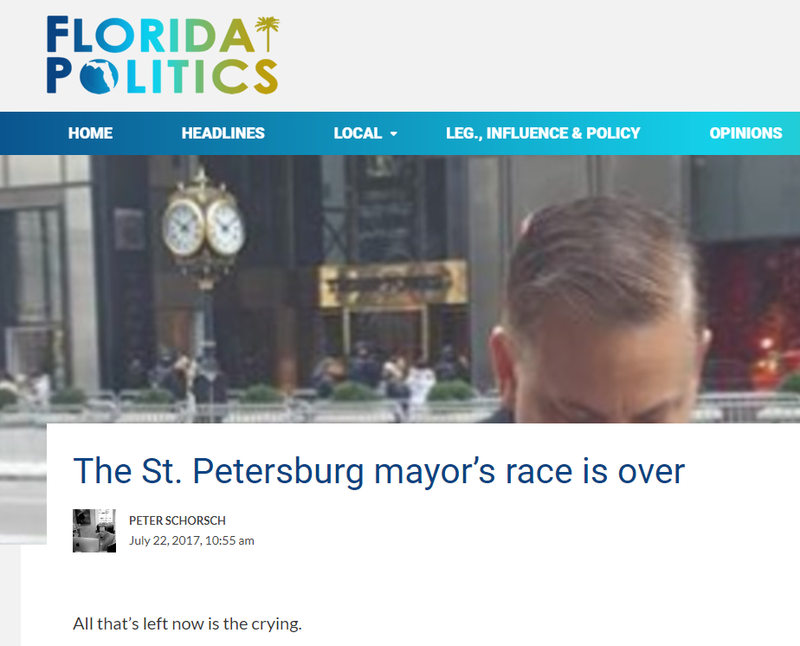 Tampa Bay Times called Kriseman “the comeback kid” in their Winners/Losers of the Week section. In the primary it was one of the biggest comebacks and the closest race we’ve in which we've ever been a part. 52-48 win (after trailing by 15; six polls showed the race a 1-2 pt race before our win. From a 70 vote win (48-48) in the primary to the general, Kriseman's performance was better with all persuasion and GOTV targets: white Democrats, African Americans and Independent (NPA) voters. Digital, TV and Radio spots: Click here. Hundreds of volunteers, the LGBTQ community, the Florida Education Association and the Florida Democratic Party all made a difference as well. Even before Kevin Durant joined the Golden State Warriors they had taken a swift path from worst-to-first among NBA franchises. All of us who build and work on teams can learn from some of their key moves – especially the Democratic Party. WARRIORS: In the 2015 NBA Finals, the Warriors found themselves down two games to one and on the ropes with the Cleveland Cavaliers. Coach Steve Kerr’s “special assistant,” (the team video guy), Nick U’Ren, came to Kerr after a Game 3 loss and suggested having non-starter Andre Iguodala guard LeBron James, based on what he saw in videos of the San Antonio Spurs and how they had guarded James in a past NBA finals. Kerr did it. It worked, and not only did the Warriors win three straight games and their first title in 40 years, but Iguodala become the first non-starter in NBA history be named Finals MVP. DEMOCRATS need some disruptive thinking and that usually doesn’t happen from the top strata of any party in Washington DC. From the grass roots to some of our best strategic brains, you can’t get communications up the chain of command if you don’t have a system for the communications, and leadership that has a loop of aggressively getting feedback, putting some of it into action and then repeating the process. WARRIORS: Before the start of the 2011-2012 NBA season, the Warriors had not had a winning season since ’07-’08. About their only bright light was Monta Ellis (22 points per game) who led the team in scoring the previous year. Lacob made the stunning decision to trade him in March of 2012, which freed up salary cap room as well as Curry’s playing style, allowing him to create opportunities for himself on the court. In the short term, Lacob was vilified. In fact, at the halftime ceremony honoring Warrior Hall of Fame Player Chris Mullin, the crowd did not stop booing Lacob the entire time he was on the court. For an introvert, you can’t imagine a bigger nightmare than when the one time you get out in front of the public --- this happens. DEMOCRATS have lost approximately 1,500 offices since 2009. We can’t move forward without new blood. From the top to the bottom of the ticket, we need to make space in our party for the talent of the future that was not necessarily the talent of the past. WARRIORS: Years ago, no one imagined the meekly-built Steph Curry as a two-time NBA MVP. In 2011, Curry had just had a season ending ankle injury, and the Warriors needed to decide whether or not to give him a contract extension. If they didn’t, they would likely lose him to free agency. There was a great debate about giving a four-year, $44 million-dollar deal to a player who might be damaged goods. Then, Lacob asked THE key question: “Has anyone ever had a career-ending ankle injury?” The team discussed. Knee and foot? Yes. But no one knew of a career-ending ankle injury. So, Curry was given his extension. DEMOCRATS have lost three of the last five Presidential elections and could have won all five. There has been a plethora of finger pointing, ideological food fights and dismissal of the rise of the progressive movement. Local and national party leaders need to ask the right questions, not keep pushing the same old answers, or answers that merely advance their own pre-2016 points of view. WARRIORS:In 2013, the Warriors improved more than any other team (+wins vs. previous year) and Mark Jackson was in the running for “Coach of the Year.” The team’s leadership still saw problems with Jackson getting them to the next level. For DEMOCRATS to be a majority party again, we’ve got to let go of some elected leaders and political advisors who have been great in the past but can’t get the job done in the future. Some of the best campaigns in recent decades were not from frontrunners and established candidates with all the heavyweights of either party on their teams (i.e. Clinton ‘92, Obama ‘08), but were longshots with a hungry and cohesive team. The WARRIORS managing partner, head coach, and general manager were all new in these positions right before they won their first title. But they had team consultant Jerry West to lean. West is a Hall of Fame talent for the three phases of his basketball career: a) All-Star Lakers player (his body is the model for the NBA logo), general manager (led Lakers to three titles) and team consultant (Grizzlies, Warriors). DEMOCRATS in some sectors want to revert back to past approaches and others want to throw out the experienced methods and people. A blend of new blood and seasoned candidates, senior advisors and grass roots talent is probably the right mix for most teams. A blending of best practices they never change in politics with the latest techniques and technology is a signature of a great campaigns and political movements on the rise.